When I think of Vaporesso, I tend to think of quality. Generally speaking their devices are well made, reliable and deliver a pretty good Vape. So Vaporesso decided to have another look at their Aurora Pod system, and have come out with the Vaporesso Aurora Play. A 650mAh ‘zippo’ style kit with a very smart ‘press to fill’ top filling pod. Very handy. The first thing I have to mention is of course the top-cap/lid of this device, which in all honesty I’ve spent more time flipping and flicking than vaping at times. It’s like a Fidget spinner for vapers. And it makes that satisfying metallic clicky sound we all know from Zippos. There is a bit of side-to-side movement in the lid, but I have every faith in the lid mechanism as its put together really well and little latch that holds the lid down is made from a solid piece of metal. The rest of the device is solid, the beautiful Brushed Bronze finish looks to be extremely hard wearing and even when I dropped the kit, it didn’t know any chips or scratches. The button on the side to change the wattage setting is nice and clicky and the tiny LED indicator is bright and clear, even in direct sunlight. The Vaporesso Aurora Play has 3 wattage settings, varying from 9w up to 12.5w and these are all indicated via the LED. I also really like the little window on either side of the Aurora to see how much e-liquid you have left in the pod. The Aurora has a bit of weight to it, so it feels great. And because of the slightly curved edges its really comfortable in the hand. The finish is very smooth so don’t be too careless or it could slip out of your hands. The 2ml capacity pod, with a 1.3Ω coil is a substantial feeling pod. But the main feature with this pod is the clever top-filling valve system which means there really is no need to take the pod out of the device. Until of course it’s time to fit a new one. Using the provided 10ml filling bottle, it fills with ease. Be sure not to use bottles with a very soft/flexible tip as you do have to put a bit of force onto the valve in order to fill. The drip-tip is also removable so handy for cleaning etc. One thing I have noticed is I do get the odd bit of liquid which has found its way down to the contacts of the Pod. Causing the device to not work correctly. So be sure to regularly check that, and give it a good clean if necessary. How Does the Vaporesso Aurora Play Perform? 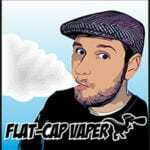 I spent the last week switching between a 3mg Drip-Hacks – Honeycomb Latte (80VG/20PG), and a 20mg Pod Nic Salt – Ice Menthol (50VG/50PG) in each of the 2 provided pods. Generally I had the device at the highest wattage (12.5w) but it still performs very well, even at the lowest setting (9w) – In all honesty there isn’t a massive difference in the 3 wattage settings. But it’s nice to have the option. Even with the 80/20 e-liquid, I didn’t experience any dry hits or loss of flavour. The coil wicks really well, even when giving it a good thrashing. And I feel the coils will last really well, a week has gone by and both pods are still performing excellently. One thing that did annoy me was when vaping on the Aurora Play, the lid/top-cap just flaps around near your face, which can be a bit annoying. The only way to combat that, is to hold the device in a really funny way. The flavour from the 1.3Ω coil is really good, I especially enjoyed it with the Ice-Menthol. You really do get an experience which is very close to when I used to smoke menthol roll-ups. Which is exactly what you want a device like this to do. And of course you won’t be fogging out the place with this device, but it does deliver a nice amount of vapour. The draw from this kit isn’t too tight, and isn’t too loose. It’s about spot on, I didn’t feel I had to draw really hard on it to get a good vape. I think it’s fair to call this a very restrictive Direct-To-Lung pod kit. In fact I wouldn’t recommend this for dual-purpose. Its extremely tight to draw on. But it does deliver good vapour production and the flavour. The battery performed a little better than I expected for a 650mAH battery. Using the 20mg e liquid, it was pretty much lasting me all day, with perhaps a little charge nearer the end of the day. But when using the 3mg eliquid, it meant I was vaping a lot more and so the Aurora was starting to struggle after around 5 hours. But with a 45 min charge time, it’s not a massive issue. And I found a quick 15 min charge every now and then worked wonders. The Vaporesso Aurora Play really is a very good Pod kit, for styling and feel alone it ticks all the right boxes. It’s a bit of a shame that I experienced some minor leaking during my testing, let’s hope they can iron out this issue for the final Consumer release. With a crazy number of Pod kits on the market it’s hard to see how anything new can make an impact. All I know is that if you pick this kit up, you will be more than happy with it. And it certainly replicates the experience of smoking more so than a lot of other pod systems. If you’re a fan of Zippo’s, or even if you tend to fidget with something, you’ll really enjoy the Aurora Play. I’m not sure as yet how much it will cost, but if they get the pricing right, it would definitely be worth considering as I believe the Aurora Play will out-last a lot of pod systems currently on the market thanks to its excellent build quality and finish.